Beach Hut Music Store - Here you will find some of our favorite artists MP3's, CD's, Bio's and Gig schedules. Thank you for supporting our local music! Who would have thought that a young girl who grew up in Westchester County, New York would have such a love for country music. Rebecca Chapa was born to a Polish/Lithuanian mother far removed from her cultural heritage, and a Mexican father who came to the United States as part of the Bracero Program when he was 13. Despite his heritage and the fact that the family owned Mexican restaurants, Chapa’s childhood was devoid of musical influences from both cultures other than listening to the mariachis weekly at their Sunday dinners at the restaurant. Still her childhood was steeped with music. Throughout the journey through music Chapa was guided by classical influences of her mother’s love of traditional music, the love of her maternal grandfather for classical compositions and the unique musings of a choir conductor, Nancy Zarowin, who was always up for a surprise, such as prepping her choir with everything from Spirituals (Ain’a That Good News sung at Sacre Coeur in Paris in Chapa’s senior year of high school), and a Latin Mass sung at Chartres cathedral during a Sunday Mass. This diverse background makes Chapa’s music hard to define yet accessible to multiple ears. She has an innate spirituality that often comes across as a bit preachy but is not meant to be so… She loves the purity of bluegrass and the truth presented in the lyrics of country music. As a writer her honesty shines through each piece she writes. She is comfortable knowing that what she writes will resonate differently in every listener and just hopes that it will touch a chord in each and every one. Chuck Colley is a guitar player, singer/songwriter and publisher residing on Nantucket Island. At present, Chuck plays acoustic instrumental guitar and sings original roots music with Erik Wendelken. Chuck and Erik are often joined by Chris Westerlund (mandolin) and Caleb Cressman (fiddle). In 2009 Chuck and Erik joined with Aoife Clancy and continue to play together with a refreshing mix of American and Celtic roots music for certain venues. Chuck sang with Eelgrass, Nantucket’s own bluegrass band and played the northern new England folk circuit in the late 1970’s. 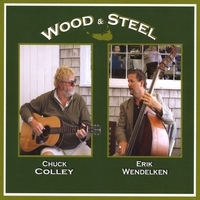 Chuck’s 2008 release, Wood & Steel, is an instrumental collaboration between Chuck and Erik and is an interesting departure from the vocal music these two have thrived in for many years. It has been described as Folk/BlueJazz. Erik is a seriously accomplished bass player, singer/songwriter and the two have been in each other’s music for more than fifteen years. Wood & Steel has a follow up release already in the works. The most recent recording, just released in February 2013, is titled 6 X 6 and it features six vocal tunes by Chuck and six by Erik. All ready receiving radio play, and good reviews, 6 X 6 is an interesting mix of true acoustic roots music. Click on the artist name or picture to visit their website and buy music. Advertise & Promote Your Music With Us For Only $10 A Month!